Once in a while, in today’s serious, stressful world, it’s important to stop, take a rest … and find yourself face-to-face with the most endearing, enduring duck the world has ever known. 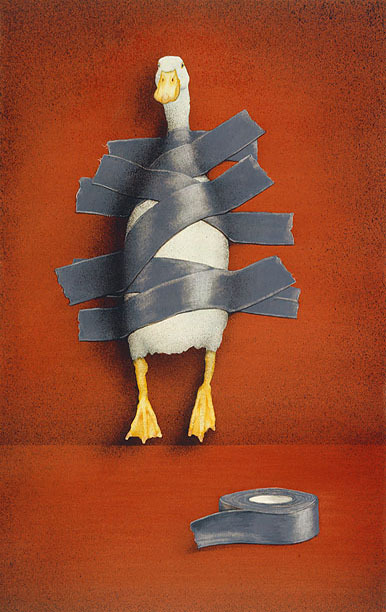 Will Bullas’ world-famous painting duck tape… is available as an Anniversary Edition Fine Art Giclée on Canvas. The bigger duck tape… gets, the funnier it gets, but you’ll have to see it to believe it. Because our Greenwich Workshop Fine Art Anniversary Editions are produced on canvas, there’s no need to hide them behind glass, which is ideal—nothing should come between you and your duck.